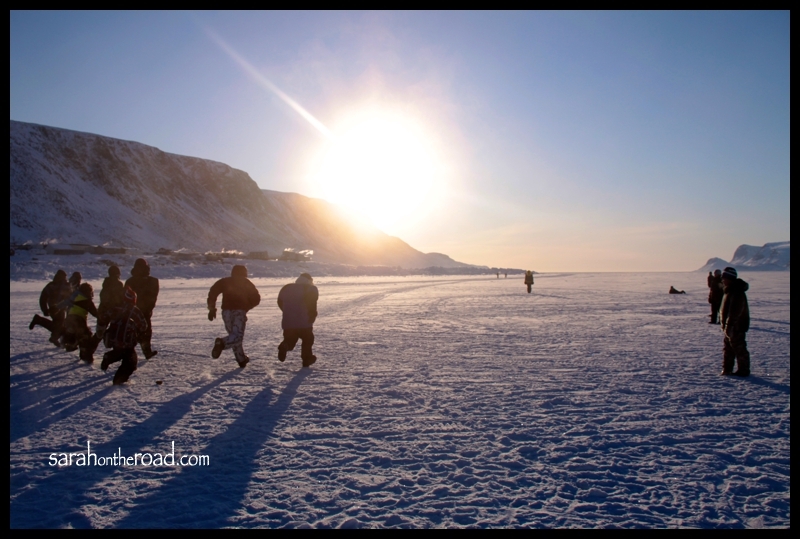 Wordless Wednesday XIX: Leap Year 2012…still light at 5:15pm! 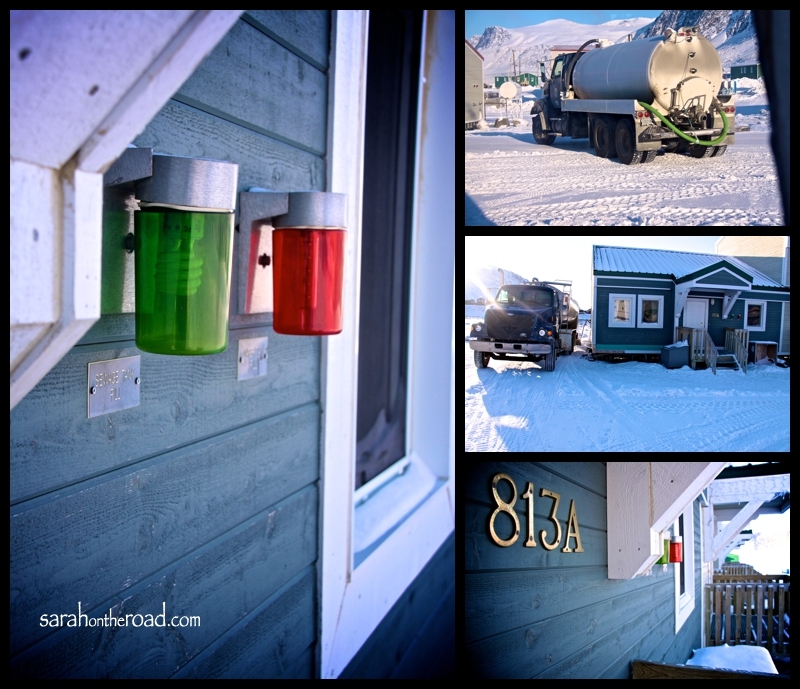 This entry was posted in Wordless Wednesday on February 29, 2012 by Sarah on the Road. This weekend I came across this video on Facebook. It was created in Nunavut’s capital Iqaluit. You can totally see the influence Scottish Whalers have had on music and dance! It made me smile… then waking up on Monday morning I found out that a fire had destroyed a whole row of townhouses in Iqaluit. Sunday night there was a tragic fire that destroyed a whole row of townhouses in Iqaluit. The people living in most of these houses were students at Nunavut Arctic College. In the face of a tragedy like this…I’m reminded that Nunavut is just a small town, one big community. Everyone is pulling together to donate items for the families and children left homeless. The radio and newspapers have talked of the outpouring of donations this morning. There are enough clothes and parkas and boots, but many other items are still needed. If you want to give something but not sure how to help…Red Cross is taking donations. You can call the Red Cross donation line 1-800-418-1111 & request your donation be made to the “current Iqaluit response”. First Air and Canadian North are also accepting donations that will be flown up to Iqaluit. 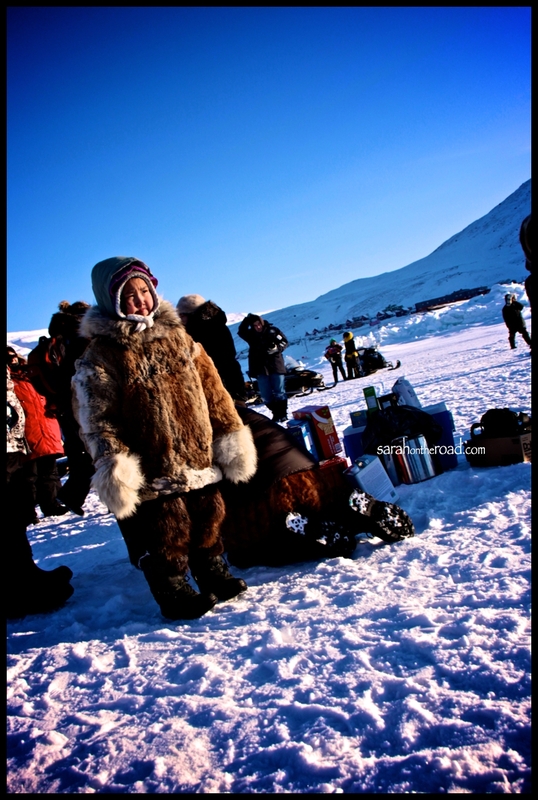 This entry was posted in Life in Nunavut and tagged Iqaluit on February 28, 2012 by Sarah on the Road. Last night when I headed over to a friends to watch a movie… I noticed that my ‘red’ light in front of my house was out. Let me back up and explain a bit. 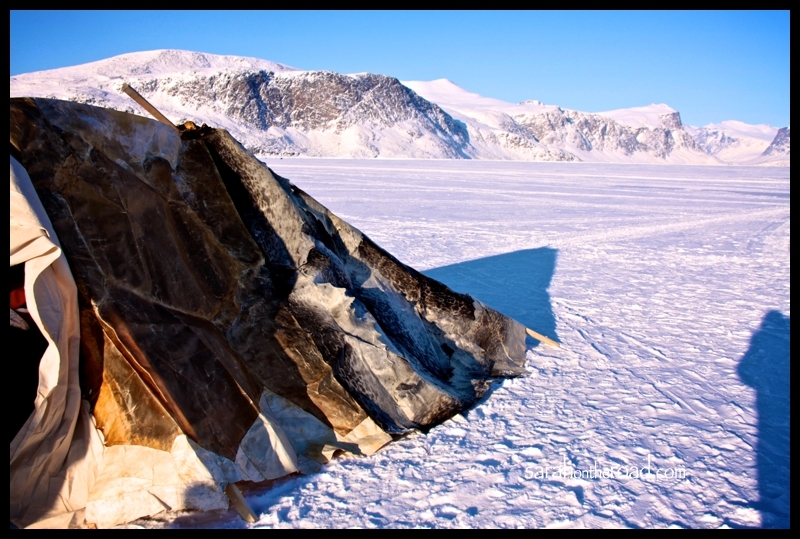 There are no water or sewage lines here in Pangnirtung. Instead every house has a water and sewage holding tank…mine is in the crawl space under the kitchen/bathroom…you can enter this area from my spare room! There are water trucks and sewage trucks that come around and pump or fill the holding tanks in your house. I think these drivers have one of the most important jobs here in town! There are green and red lights are on the front of every house. If the green light is on–it means your sewage tank is filled, and needs a pump out! If your sewage tank is full, your house’s water automatically shuts off–so any waste water won’t back up into your house! The red light is one that should be most of the time…because it lets you know that your water tank is FILLED! When the light is off…you need the water truck to bring you fresh water from the reservoir. After waking up this morning,I realized that I needed water to do laundry, shower, dishes etc… So when I saw the water/sewage trucks out and about in my neighbourhood–I called the garage and let them know I needed a pump and a fill! Now that this has happened I don’t have any excuses I suppose I best put on a load of laundry and finish up my dishes! 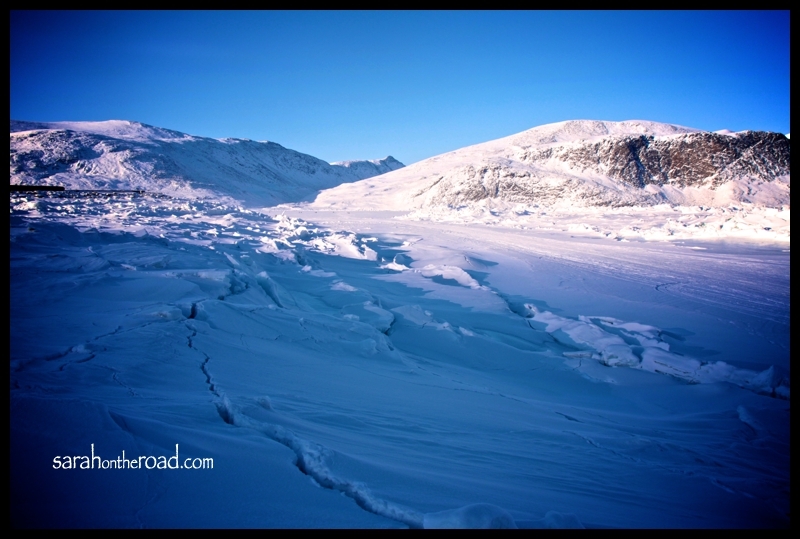 This entry was posted in Life in Nunavut and tagged Pangnirtung on February 26, 2012 by Sarah on the Road. The sun has been peaking over the mountains into town so that we can see it for the last 10days or so. I’m really enjoying how in the morning it shines on my face every morning for a little while, although it is a tad annoying because it still hits my computer screens making it hard to do work…thank goodness for blinds! 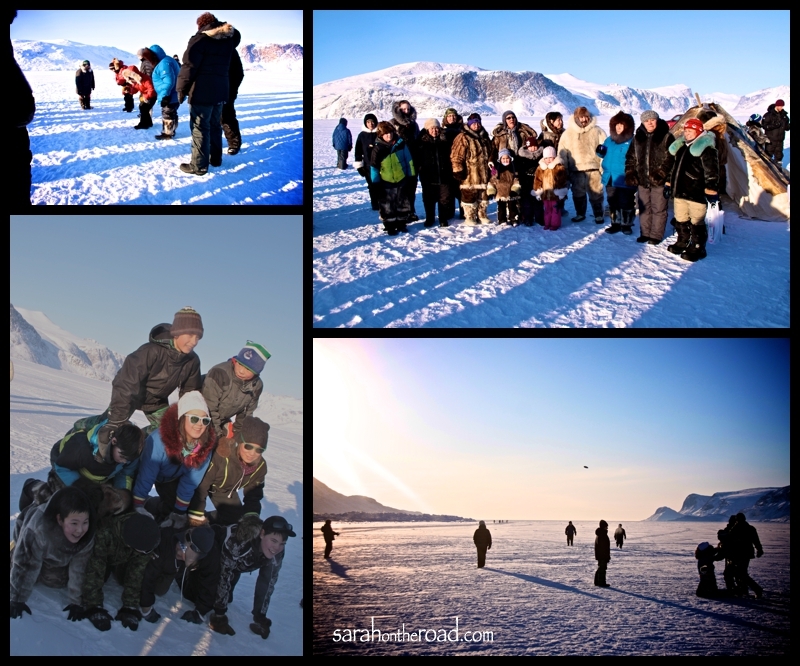 This afternoon Pangnirtung celebrated the Sun’s return…with some games on the fiord! 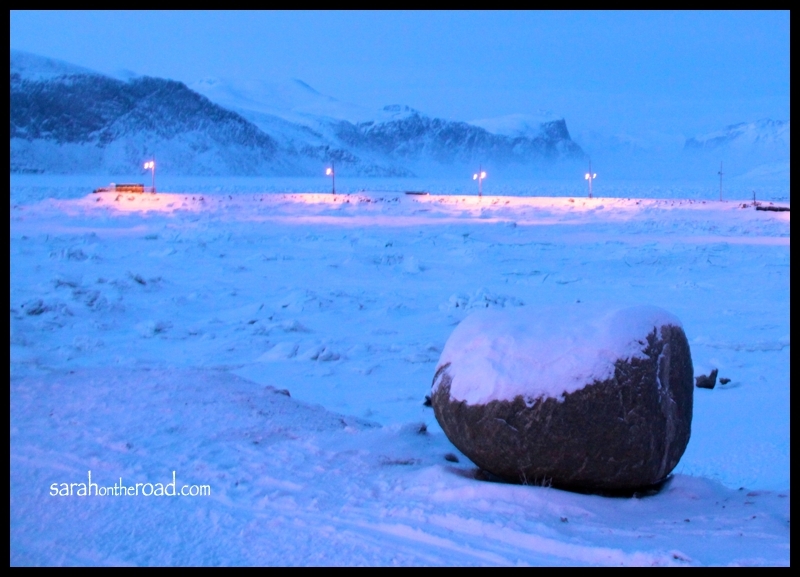 I bundled up with my warm gear and headed down to the fiord. 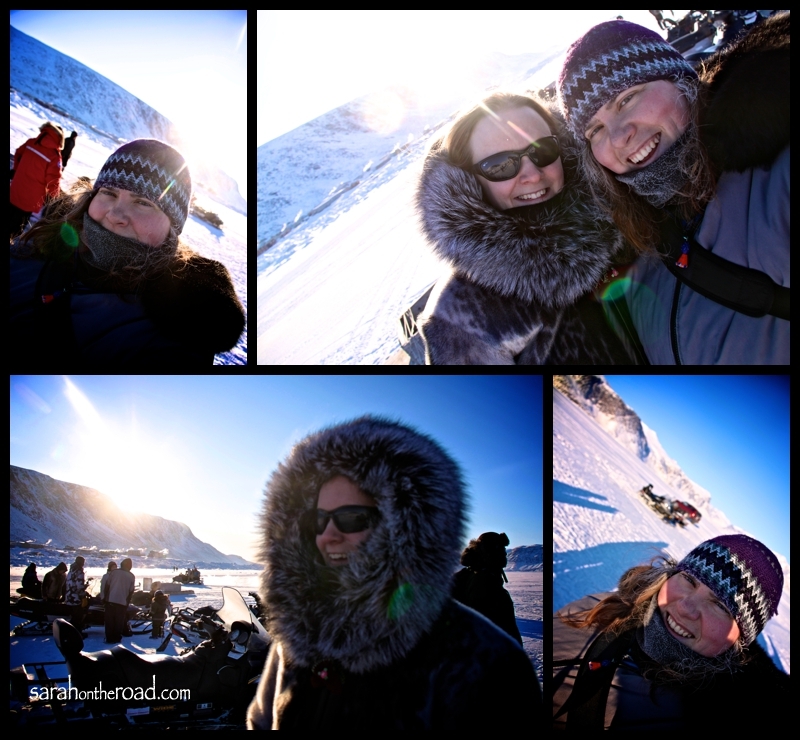 Even though it was around -29C…it was time to go out and celebrate the sun! Explaining the changes of seasons from dark to light…is hard to do. If you haven’t lived through 24hr darkness it’s hard to explain. (SIDE NOTE: in Pang we don’t experience a true 24hour dark period–it’s only about 20hrs…with twilight happening for a few hours on the shortest day. But the sun doesn’t rise over the mountains surrounding Pang from end of November until mid February). There is this sense of waking up and pure joy you get when you start to see the sun back in the sky! I was lucky I was in the south, in Ontario, for most of the dark days…but returning to the darkness was just as hard! I’m not doing a great job explaining…so I’ll let my photos do the talking! 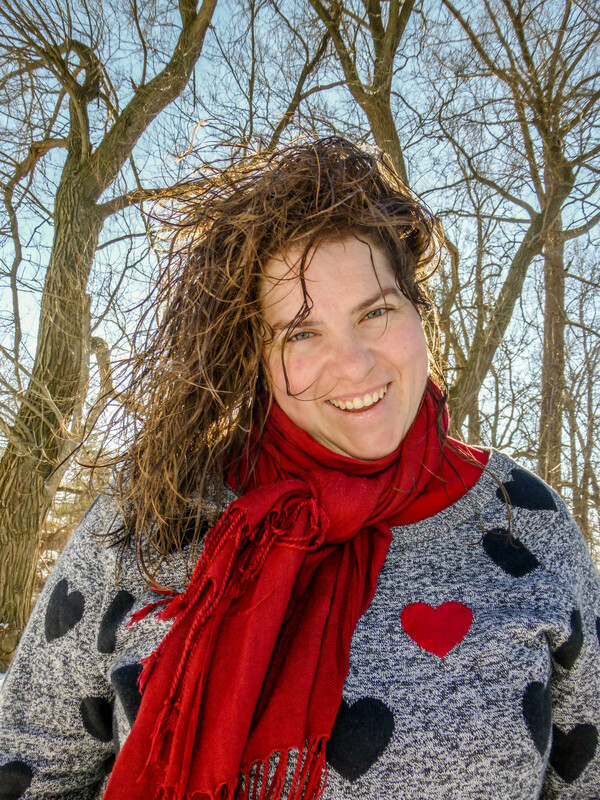 I think my self-portrait smile says it all…. 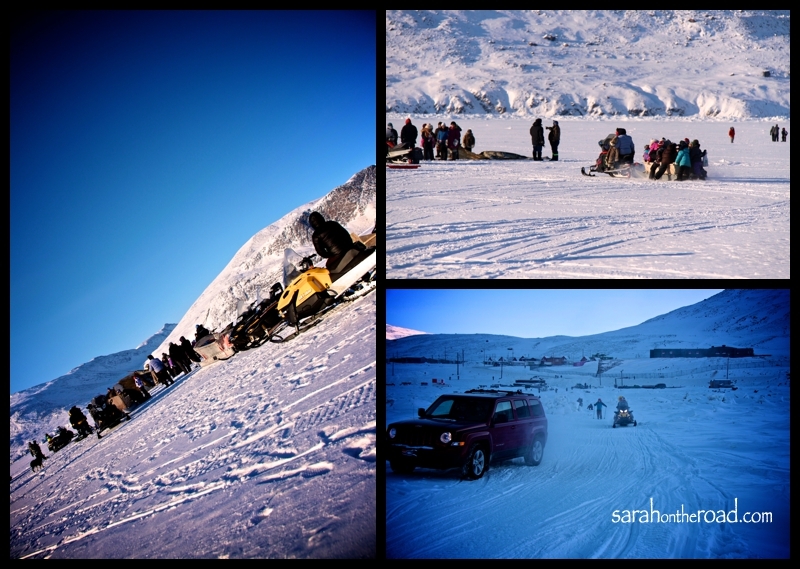 People arrived on foot, on skis, on skidoo and kamotik, and there were a few vehicles that drove out onto the ice too! I walked out…trying not to slip on the icey road in my kamiks! My view as I walked through the pack ice. 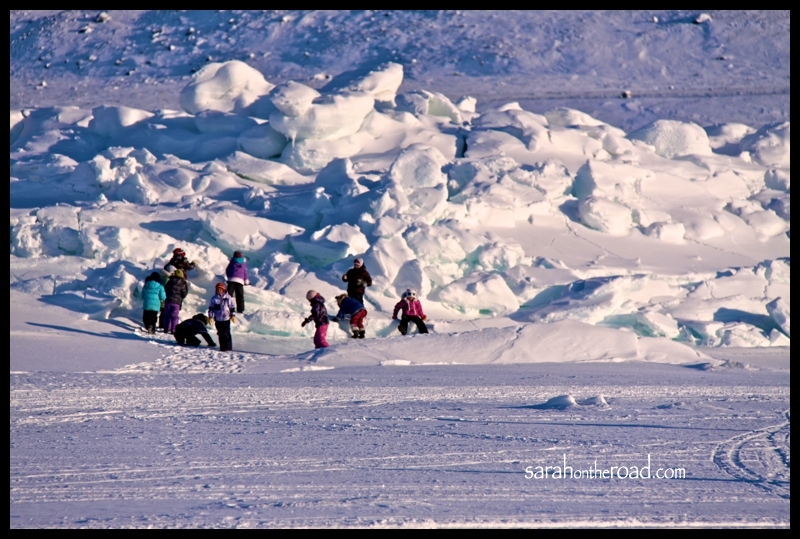 Kids playing on the pack ice…that builds up in the tidal flat area along the fiord. Basically with the tide changes even in the winter…it pushes the ice up into crazy stacking ice formations as the ice cracks! Here’s a group shot of the some of the people that came out to celebrate the return of the sun… as you can see even some dogs came out to join our celebrations! Yep, it’s totally true…when you are celebrating the return of the sun…you need to take as many cheesy self-protraits of yourself basking in the light. And maybe imagining yourself on a different beach..with a few less layer of clothing! The skin tent that was made this past summer… was brought out to be a ‘warm-spot’ and place where tea and bannock were! I participated, I wasn’t the last in the woman’s race…nor was I the first…and I didn’t fall down, even though I was running in my kamiks! Traditional fur made Amauti…designed to have an extra ‘pocket’ to so that the woman’s baby is held against the mom’s back. This little baby slept for most of the celebration but popped out to say hello later! It was a fun afternoon… and am so glad the sun is back! It really makes the -30C days feel a wee bit warmer! Here’s one last photo I took looking towards Mt. Duval. 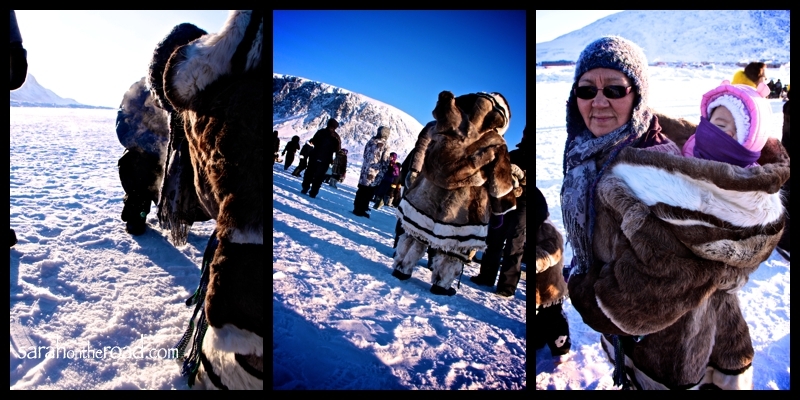 This entry was posted in Life in Nunavut and tagged Pangnirtung on February 24, 2012 by Sarah on the Road. This morning I straightened my hair for the first time in awhile. As I was finishing up… I looked in the mirror and thought to myself, “what the heck is that TINSEL doing coming out of the TOP of my head?” Anyone who knows me knows I’m not a morning person..and possibly was 1/2 asleep when I thought that thought. But under closer examination, I realized it was a white/grey hair. 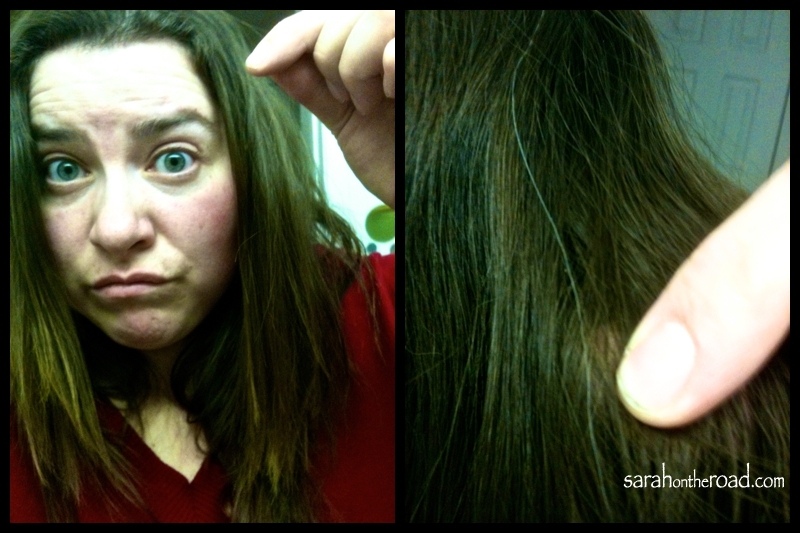 Yep, I noticed my first white/grey hair…it’s probably been going on for awhile up there on the top of my head. I really wished I hadn’t looked so closely…and then I’d still be in happy denial! I knew it had to happen, and I know there’s just the 1 or maybe more–didn’t do that close of inspection…but it’s kind of that rite of passage deal. You know like welcome to Grey/White Grown-Up Club…I know many people have entered it before my age…I guess I’m finally grown-up enough to join! The other thing I noticed when I was straightening my hair is my ‘weird’ hair cut. I knew when I was on holidays the hairdresser I visited did a number on it…but well didn’t want to ‘correct’ it so just went with it. Yep, so now I have two very distinct layers in my hair. I’m really glad I don’t worry about these types of things, honestly most of the time I have my hair under a hat, or in a pony tail! The photo on the right is my "yes, I'm cool with these weird layers...until the next time I head south for a hair cut...kind of look" Convincing eh? The days are getting longer…the sun rose at 7:05am and set at 4:07pm. Yep, when I walked home at 5pm tonight I could still see the pink of the sun setting at the end of the fiord. It was nice to walk home in the twilight… a few more weeks and it will be still SUNNY when I walk home! 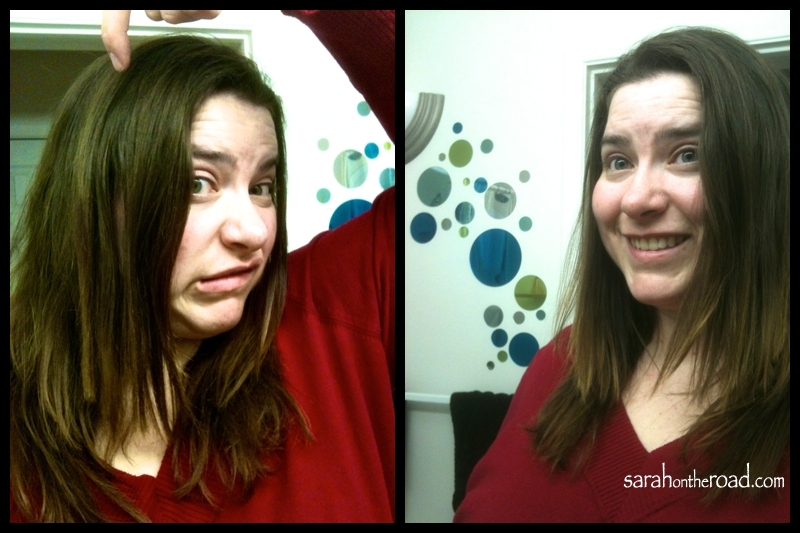 This entry was posted in Random, Rants & Reflections on February 22, 2012 by Sarah on the Road.